Info Trigger Ads might start appearing on your screen if your system is infected with Info Trigger, which is a typical advertising-supported application. 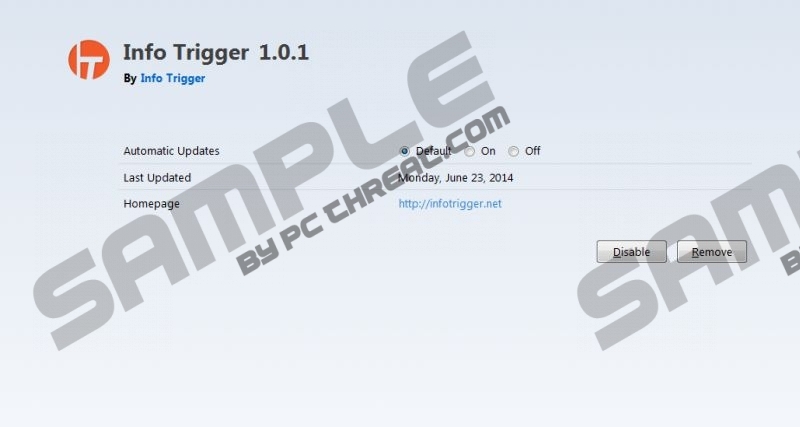 Even though this application has its official website infotrigger.net, it has been found out that it usually enters the system bundled with freeware. Actually, it does not really matter how Info Trigger has appeared on your computer because we still recommend that you remove it as soon as possible. If you wonder why it is so, you should know that this program is just going to flood your screen with various commercial advertisements labeled as “Info Trigger Ads” instead of improving your browsing experience as promised; thus, you should remove Info Trigger without any further considerations. If you do so, you will definitely prevent Info Trigger Ads from appearing as well. The presence of Info Trigger Ads is not the only drawback of Info Trigger. The specialists of pcthreat.com have found out that this application is capable of acting behind your back. For instance, it might connect to the internet without your permission. Do you want to avoid similar undesirable software in the future? If so, do not forget to download programs from reliable sources and install them attentively. Do you want to feel completely safe? If so, you should also acquire a reliable security tool and keep it enabled all the time as well. Luckily, it is not difficult to erase Info Trigger because this piece of software can be eliminated via Control Panel. Of course, you can get rid of it automatically as well; however, you will have to acquire a reliable antimalware tool first. These methods will help you to stop Info Trigger Ads from appearing as well; thus, you should definitely not postpone the removal of this adware. Find the application that needs to be removed. Click on it and then select Uninstall. Quick & tested solution for Info Trigger Ads removal.